You are here: Home / Main Course / Beef Recipes / Shepherd’s Pie- Fun with Jars Friday!!! 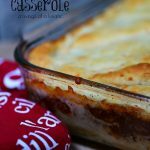 Shepherd’s Pie- Fun with Jars Friday!!! Okay folks. Before I begin there’s something I’d like you to do. Okay, okay so there’s two things I’d like you do. Okay, okay so there’s really three things I’d like you do if we’re being really honest here. . Geez eh, barely in the door and I got you helping out already. That’s how we roll here at the Bee household. Okay I’ll go easy on you and just have you do two things. Okay thing 1- go HERE and enter for your chance to win a cookbook. Yes this is me hosting. All you need to do is comment. So if you haven’t entered yet there is still time. The giveaway is open for another day. Closes tomorrow night at midnight. Okay thing 2- Read this post! No seriously. It’s freaking fabulous, trust me. Alrighty-roo now that I’ve monopolized all your free time I sure hope I’ve made it worth it with these little beauties. I had made the Black Forest No Bake Cheesecakes in a Jar last week and they seemed to be a real hit with everyone. Shucks, golly, gee, I feel so special. But gosh darn it how do you follow-up something like that. The pressure was on, the anticipation was immense and I was cracking under the pressure. Okay so that’s a big old lie. I was probably drinking a pepsi and watching the Real Housewives of Somewhere or Someplace and at the last second realized I had better make something or the only thing in a jar was going to be my pride. So I whipped up these. And with leftovers to boot. I had made a double batch of the mashed potatoes I did for a cooking challenge just knowing I could do something fun with them. And if not we could eat mashed potatoes for days or snack on it like ice cream. Not like Roasted Garlic Mashed Potatoes were going to go to waste around this household. No sirree bob. Yes that’s how you spell that. So I put on my thinking cap and this just popped into this blonde head of mine. I know right. Pure genius. I know, I know, it’s remarkable how brilliant I am. And humble too! And so serious too! So check these out. Be sure to love them. We sure did. If you make these and you are someone who does NOT use common sense, here’s a bit of advice for you. Do NOT serve these immediately as you and/or your guests could burn your hands on the jars while trying to eat them. Let them cool a little bit BEFORE slapping them on the table. DO NOT serve HOT JARS to SMALL KIDS who DO NOT KNOW BETTER. If you do I am NOT responsible for your LACK OF COMMON SENSE! Take care now, signed Lunie! Okay sorry about that all my lovelies but it just had to be said. I can just see someone coming back here to scream at me. And since I’ve already used the word dumba** once this week I really don’t want to have to call anyone else a dumba**. Okay so last time I called myself one but you know, just sayin’!! Okay moving on. No more profanity on this blog this week I promise. I swear (lol) since I admitted to my trucker mouth it’s all gone downhill here. Let’s crank up the class again folks. And nothing says class like Shepherd’s Pie in a mason jar! Enjoy!!! Mashed potatoes I had leftover Roasted Garlic Mashed Potatoes so I used those. I would estimate using 4 to 5 potatoes if you don’t happen to have leftover mashed potatoes in your fridge. But seriously who doesn’t have them in the fridge! 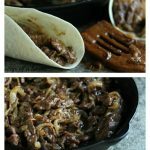 Brown you ground beef in a large skillet. Add any spices you want to it. Add any optional items, like onions or shallots. Add the ketchup and cook over medium heat for about 5ish minutes. Now add the bisto and the beef stock and cook until it absorbs. Always best to start with less bisto and add more if desired otherwise it’ll be a big goopy mess. If you don’t have leftover mashed potatoes you need to whip those up. You can find a great Roasted Garlic Mashed Potato recipe HERE. Now add a layer of meat on the bottom of the jar. Now add a layer of corn to the jar. Now add your mashed potato layer. Drizzle some melted butter over top. Place in your preheated 350 degree oven ( I found it helped to place them in a cake pan so they were easier to maneuver in and out of the oven and did not tip over) and cook for about 20ish minutes. They are done when they go golden brown on the top. Yield is tough on this one. I made 4 x 250 ml jars plus a casserole dish. So just guessing this recipe would make 10 to 12 jars. But that is a guesstimate! Just remember not to let any d.a.’s touch the hot jar! Seriously, someone is gonna touch it and then you’re gonna be sorry! Then you’re gonna come here and yell at me and make me sorry! Now fair warning on the hot jar issue. Trust me it can happen. The doc said my bandages can come off next Friday. Just in time for the next FUN WITH JARS FRIDAY. Hmm, wonder what kind of trouble I can get myself into next week. 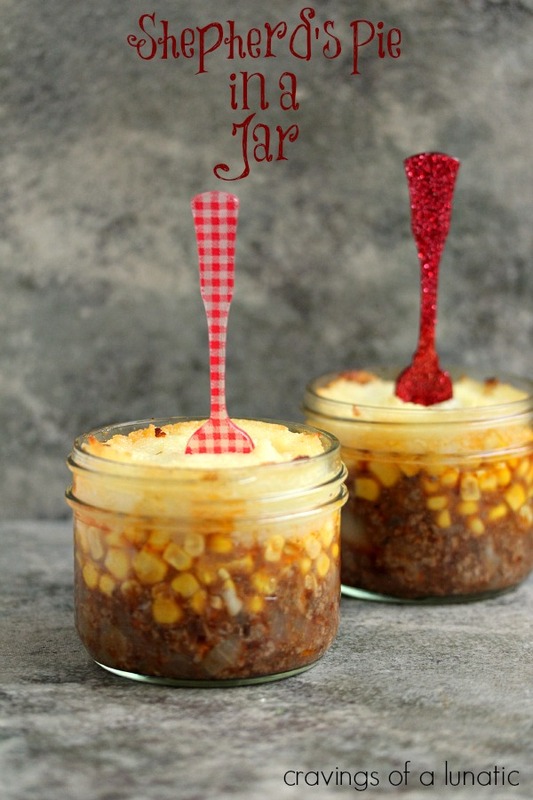 I about busted a gut when I read, "Nothing says class like Shepard's Pie in a Mason Jar"! You are SO funny! These look terrific, Kim! I didn't know if you'd be able to top the first one, but not doing a sweet dessert was brilliant! I'm really enjoying Jars Fridays, great idea with the Shepherd's Pie! Can't wait what you'll do next Friday! Ping- Thanks for the tip. Off to check that now. Been a long couple of days so my brain is well…blonde! Lol. Glad I am perking you up. @the food dude- Yah, I love hearing people like this stuff. The pressure is on for next week. Doc has been notified to clear his schedule! @Ping- All fixed now and put it in a few places. Thanks so much for the heads up on it. Hope you try them out. Found them on Steamy Kitchen and they are now my favorite mashed potatoes in the world!!! Wokay. Works now. Checking now. I love mash so that button was seriously important. Ta. What a cute serving idea, Kim! 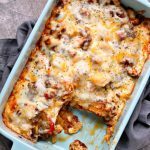 I love it…and I love Sheperd's Pie so I might try these when I have a dinner party. Hubby would love these beauties! It's time I buy some canning jars and join in with all your delicious recipes 🙂 Happy weekend, Kim! These are so cute, Kim!!! As cute as…as…as… heck, I can't think of anything, so I'll just say "as cute as ME"! That's pretty darn cute! And humble. And serious. Waitaminnit, there's an echo in here. I want these. With a Coke. So I buzzed these. While drinking a Coke. I don't think I've enjoyed reading a post so much in a long time! I assume you've had comments–LOL. They really do look good. I better buy me some mason jars (and some new hot pads). You have such a fun blog. What a great idea for shephers pie. I made this for my daughter's friends a few weeks ago. Wish I'd had this recipe, they would have loved it! @Ping- Lol. I am glad you are off to see those. They were fun to make. @Dzoli- You have to try. It's oodles of fun! @Amy- Thanks so much my dear. You have to try them. So cute. Just warn people. I'll get thumped on your fb otherwise. Lol! @Lizzy- You must. SO much fun! I don't can so I had to go buy some. Actual canning scares me. This I can handle. Lol. Happy weekend my friend! @Janet- I fell down laughing at that. Then drank a pepsi! @Cathy- Thank you so much. That is so sweet of you. I so enjoy writing this stuff so always nice to hear people like it. Mason jar and hot pad stock must be rising today. Buy that too! your too funny, and feel free to call me a dumba… anytime its appropriate! 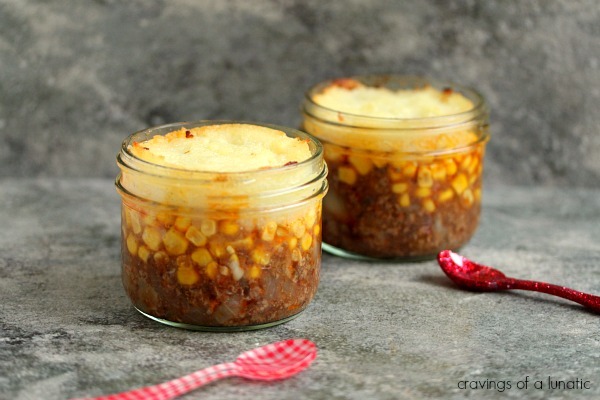 I love those little jars of delicious shepherds pie, what a great way to serve them! You're too much! This post had me laughing. 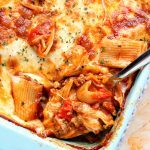 I love this especially since you used left overs. They look really good! I think you just may have topped the black forest cake in a jar for me! HAHA! You're too much! I loved this post. 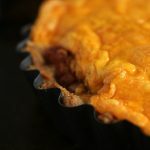 The shepards pies look great, but I most loved your cautionary warning about serving them too hot. I really love this jar-cooking series you've started. Absolutely love your jar series 🙂 brilliant! Cool idea for the jar series, would have never envisioned Shepherds pie. Love that you can see the hearty layers and what you are about to dig into. 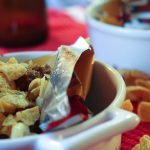 Delicious and creative! Girl, how do you have time do all these blogs! I can barely keep up with my one. Amazing! This is such a fun idea. Just what I needed. Portable potato goodness. I'm done for this holiday season. Pulling out my stretch pants early. @Chef Dennis- Oh good lord, you're giving me permission to call you a dumba** is probably a huge mistake. I'll be just sitting on pins and needles now waiting for the right moment. Lol! Thanks of the compliment. @Karen- Aw, thanks so much. @momdecuisine- You are so sweet. Thank you. @Katherine- Thanks. I am a lucky duck lately. @healthyfoodietravels- Thank you so much. @Happy When Not Hungry- Thanks! @Tina- Thanks so much. I am having a blast with this stuff. @OnSugarMountain- It sure is fun. There is so much you can do with them. @Lindselicious- I have no idea, insomnia I suppose. Lol. Thanks so much. @Grubarazzi- Roflmao…that cracked me up. Stretchy pants are good for winter. And spring. And summer. And fall. Oh, I’ll make this all right. But some time ago I learned to make a square basket type of pot holder for jars and bowls. One per person, and they can go into the microwave. No kidding; they are fantastic! We heat up and serve our soups in jars or bowls in the microwavable pot holders all the time. You need some. Do you sew? I wish I could sew but unfortunately in my list of strengths. They sound super useful and cute though. I would love to make these for a ladies luncheon (25 people). Do you think it would be okay to make these ahead to freeze and add the mashed potatoes before baking? Hi Maria. Absolutely!! I freeze them often. I even done it with the mashed potatoes already on it. I wouldn’t recommend that for an important event, more for home use with the family. If I was making these for a group event I’d freeze the bottom layers, then make the potatoes fresh. You could make them really fancy and pipe the potatoes on top with a nice swirl or pattern. That would be so cute. Let me know how you like the recipe. It’s a spin on my mom’s recipe. So hopefully you like it. If you need any more help just hit me up or email me at cravingsofalunatic@gmail.com. I’m always happy to help anyone who needs it. Was thinking of doing freezer prep for my toddler too, about how long do you think it could be stuck in the microwave for? Hi Sara. I usually put them in the microwave for 1 minute but check them after 30 seconds. Are you heating them after thawing them? I know this is an old post…. just hoping someone will answer :). Think these can be pressure canned? Hi Lori. I wouldn’t pressure can them, personally. BUT the good news is they freeze beautifully. I freeze them constantly. Can’t wait to try this one!! And some of the other “JAR” goodies, too! PERFECT little “gifting” idea for a couple of my “singles/elderly” neighbors! Thanks so much!